Well, well, well. Score one for Microsoft. Today they announced that the highly anticipated sequel to the Tomb Raider reboot, Rise of the Tomb Raider, is coming exclusively to the Xbox One. Seeing as many thought this would be a multi-platform game coming to both systems this is a big win for the system that has been doing nothing but turning its image around since the reveal. 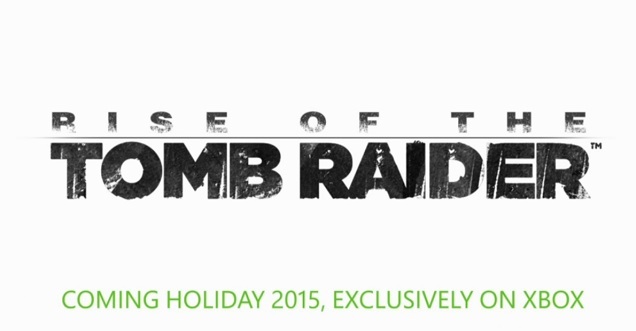 As you may have seen, we’ve just announced that Rise of the Tomb Raider, coming Holiday 2015, is exclusively on Xbox. We consider all of you to be the lifeblood of Tomb Raider and the work we do at Crystal. I’d like to give you some insight into this decision, and why we feel this is the very best thing for the Tomb Raider sequel we’re creating at the studio. Tomb Raider in 2013 was a success due in large part to your continued support. Our goal has always been to deliver something truly special with Rise of the Tomb Raider. Today’s announcement with Microsoft is one step to help us put Tomb Raider on top of action adventure gaming. Our friends at Microsoft have always seen huge potential in Tomb Raider and have believed in our vision since our first unveil with them on their stage at E3 2011. We know they will get behind this game more than any support we have had from them in the past – we believe this will be a step to really forging the Tomb Raider brand as one of the biggest in gaming, with the help, belief and backing of a major partner like Microsoft. This doesn’t mean that we’re walking away from our fans who only play on PlayStation or on PC. Those are great systems, with great partners, and amazing communities. We have Lara Croft and the Temple of Osiris coming to those platforms this December, and Tomb Raider: The Definitive Edition is available on PS4. We know that there are probably many more questions and concerns. Please do send them to us, and we’ll answer to the best of our ability. Meanwhile we’re going all out to try and make something truly special – the most ambitious Tomb Raider game ever built.